“Listeners wary of original compositions – and with Jones they needn't be – will find that there are enough echoes of things they already love to draw them in. 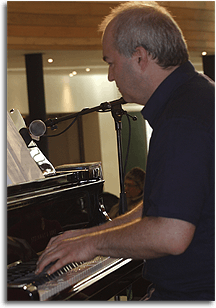 The individual players also walk the line between tradition and individuality with equal success” (Jazz author and saxophonist Simon Spillett) Pianist/composer Dave Jones has toured and recorded internationally (including collaboration projects with the bands Burum and Khamira) in India, France, and Ireland, and also composes music specifically for TV and film, having tracks used in ‘The Big Bang Theory’ and ‘Late Night with Seth Meyers’ (both US), the drama ‘Las Aparicio’ (Mexico), and ‘Location, Location, Location’ (UK). He also writes regularly for Jazz Journal and Pianist magazine. Drummer Andy Hague (also a trumpeter) is a prolific composer and arranger, releasing jazz albums under his own name, and has also played and recorded with Portishead, as well as being an active jazz educator and organiser of the weekly Be-Bop Club in Bristol. Saxophonist/flautist Ben Waghorn brings to this Quartet his vast experiences from a career playing for NYJO, Tommy Chase, Slowly Rolling Camera and Keith Tippett, to The West End of London as a pit musician, and also various TV and film credits as a session musician. He has also recorded/performed with bands including Goldfrapp, Kasabian and Portishead. ​Bassist/vibraphonist Ashley John Long continues to impress with his virtuosic playing.